Debbie New knits in the legacy of Meret Oppenheim and modernizes knitting in a multitude of ways. 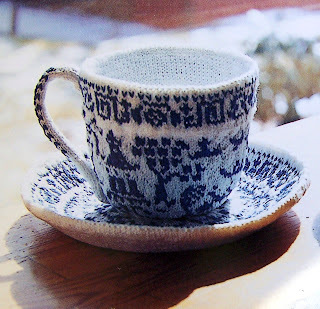 She knitted a wool teacup that reminds me of Oppenheim’s Fur one from 1936. They both defeat the functionality of the original object, but while the fur-lined cup induces a shudder, New’s cup creates the same kind of feeling as the knitting process itself– a state of repose. It is a beautiful, delicate work that is a product of the creation process itself. Knitting is modernized like sculpture and painting was 50 years or more ago. She’s also added to the traditional knitting techniques with Scribble Lace, Cellular Automaton, Sculptural, Virtual and Labyrinth Knitting. It’s chronicled in a book of hers Unexpected Knitting which I unfortunately do not own so I cannot elaborate. I understand that they’re inspired from more high art types of processes and in the case of Cellular Automation, biology. She is also speaking at the Iknit weekender which I will be missing. I’m excited to find more fiber-arts related artists. I think the traditional forms of fine art have been explored to the extent that they can be and knitting can, and should be explored.